In an effort to combine the convenience of public transit with the benefits of cycling, New Orleans is preparing to deploy a fleet of 700 publicly shared “social bicycles” for hire around this city this year, officials are busy telling neighborhood groups. The 700 custom-designed bicycles will be placed at an estimated 70 stations designated at locations in neighborhoods around the city, with a built-in lock keeping them secure until a rider with an account card “hires” the bike, Dwight Norton of the mayor’s office of resilience explained to the Irish Channel Neighborhood Association earlier this month. The cyclist will then ride the bike to the station nearest his or her destination, lock it up again, and the rider’s account will be automatically debited for the time spent riding. The benefits to the program are myriad, Norton explained. Potential riders without a bike or a way to store one will have access to them; they’ll receive the health benefits of the exercise involved; and fewer cars will be on the street, reducing both congestion and pollution. The New Orleans bike share program is modeled after the most successful efforts in similar cities around the nation, but in a relatively larger way, considering the city’s small size and population, Norton said. The goal is to serve residents first, before tourists, so the stations will be placed in each of the city’s neighborhoods, designed to integrate with the other forms of transit. For example, the social bike might spare a bus rider a time-consuming transfer to another line, Norton explained. The rider can take the first bus most of the way to her destination, then use the bike for the last portion, instead of waiting for another bus to arrive. The cost of a card will be $15 per month, which will give each rider a total of 60 minutes per day. Any time over that will cost $8 per hour, which is the same rate that tourists will be able to buy the card for. Meanwhile, the city will also offer low-income residents a pass that costs only $1.67 per month (a total of $20 per year), so that all residents have access to the program. “Sixty minutes of riding your bicycle is a lot of time,” Norton noted. Most of 2017 will be spent planning the station locations, visiting neighborhoods with maps to gather input, Norton said. They won’t be directly on the most high-traffic locations, such as South Claiborne Avenue or Bourbon Street, but near those major thoroughfares so the bicyclists have easier access. They’ll look at locations that residents are visiting anyway, such as libraries, recreation centers, parks, grocery stores, schools and hospitals. Because the bicycles are tracked with built-in GPS devices, Norton said it will be easy to designate temporary virtual “stations” at the site of major events such as Mardi Gras or Jazz Fest. That way, many riders could lock up their bikes at the site of the event, and then use them to get back home afterward, and the number of stations there could be reduced afterward. Irish Channel residents listened to Norton’s presentation with a mix of interest and skepticism. 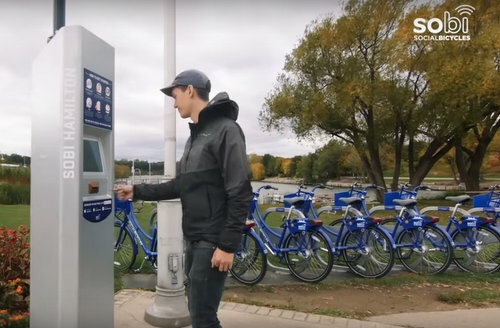 The first concern was how the city will keep the bikes from being stolen, but Sawicki said the built-in GPS will allow the city to track them, and the cards will allow the city to know who rented them last. Their custom design (which includes no chain to dirty up pants legs) also makes them less attractive to thieves who might plunder parts for the secondary market, because their parts won’t fit with normal bicycles, Norton said. Others were concerned about traffic, with one woman suggesting she wasn’t too enthusiastic about the prospect of 700 bicycles being unleashed on Magazine Street. Norton said that because the program will target residents, not tourists, they will already know that side streets (like Camp) are better alternatives. As bicycle use grows, the city will also continue to improve its bicycle infrastructure. With the major road projects ahead, the city is considering creating bike lanes between the curb and the parking lane, instead of between the parking lane and the driving lane, which has been proven to be safer for bicyclists and cause fewer crashes. When inexperienced riders feel safer, they are more likely to try bicycles, Norton explained. “What we find around the country is when you do that, people are very drawn to that,” Norton said. Others worried that bad driving by uneducated bicyclists or vehicle drivers unaccustomed to so many bicycles could cause more crashes. Part of the revenue from the bike fees, Norton said, will be directed to bicycle-safety and public-education campaigns. After fielding the questions, the program found fans among the Irish Channel residents as well. The program will be operated through a five-year cooperative endeavor agreement with a company called “Social Bicycles,” financed partly through the direct revenues and partly through sponsorships. A small demonstration of the program will be held next month, from February 10 to 23, consisting of about 30 to 40 bicycles, Norton said. That will give residents a glimpse of how the program will work, as they plan to launch citywide in the fall. As much as I love cycling for all, and I can’t wait to see this baby come into being, I fear this is going to have some painful teething pains. Just one “for instance”, The city has done nothing yet to encourage cyclists to get off Magazine street and onto Camp or Chestnut. Motorists, who are already impatient, are going to lose their minds if they are stuck behind a small armada of these rental bikes noodling down Magazine. It’s no skin off my back, but I expect the complaining will be shrill. Magazine is already a slow street. In fact, if a single one of those drivers respected the law that says you’re supposed to stop for a pedestrian in a crosswalk then they’d be going at such a speed that the bikes wouldn’t matter. And they’d have also already learned that Magazine is not a major thoroughfare to be flying down on a crosstown commute. Its to bad that the city didn’t extend bike/walking path to along newly completed section neutral ground section on Napoleon. It would have been great if the path had been extended all the way from Fountainbleau to the river. Yet another instance of poor planning.